Image: Joseph Kennedy, 15 July 2010 [larger view]. Nikon D200, Kowa 883 telescope with TSN-PZ camera eyepiece 1/1000s f/8.0 at 1000.0mm iso400. This bird is built for speed and agility in the air and is known to fly for long distances away from home. Can you name the species? I think this must be the most amazing family of birds out there -- watching them in the air is a real treat. This one appears to be molting -- you can see a change in wear at p5 on both wings, and the tail is clearly asymmetrical. The white on the head looks like a juvenile, and the size of the white patch on the breast maybe means a second year juvenile? The field marks include that cool bill, with the hook on the end, long wingspan, and a scissor tail, which I can't see here, but I'm pretending the bird is just being a tad uncooperative. There were dozens of these over Corpus Christi earlier this month, I suspect having dodged Alex. They are amazing to watch, one of the most efficient flyers, often seeming not to twitch a feather as they hang suspended in air. As we're being coy I shall withhold. The juvenile hint helped. Bardiac, this is a frequent pose for these birds, with the tail folded. As a result, you occasionally see Great Blue Herons flying high overhead mistaken for them, especially inland. Okay, can I add that it sure is a magnificent shot, and those are awful long wings for that body? Ah, thanks, Psweet! The pics I was looking at showed the tail scissored. Do you count the primaries from the furthers out to in? So about the fifth in, they look different, maybe shorter? Would that indicate that this bird (all birds?) molts it's outermost (first?) primary first, replaces it, then does the next, and so forth, thus keeping it's balance good and not losing too much flight efficiency as it goes? Ah-h-h-h! "magnificens" -- On our way to a conference in Monterrey some years ago, this juvenile came directly over our heads on Route 101--I almost drove off the road! As far as the molt patterns, that's really variable. A lot of birds do show a descending molt, starting with the outer primaries and moving in, although the secondaries molt independently, in any of several patterns of their own. Many waterfowl, loons, and grebes lose all of their flight feathers at once, and grow them in together. Some young raptors (the larger ones) molt their flight feathers in a rather unusual pattern, often over several years. Since the adult feathers are slightly shorter and less pointed than the juvenal feathers, they show a ragged trailing edge for a couple of years -- which is often the most reliable way of aging them. Regardless, annual molts of wing feathers are symmetrical, just as you surmised, probably in part for that reason. (In part just because it's simpler to control if you make it symmetrical). On the other hand, sometimes feathers get lost to predators, weather, etc. In that case, the new ones can come in in odd ways. Often the hormonal situation will have changed, and the new feathers will be the wrong color. At our hawkwatch a few years ago, we had a Red-tailed Hawk with a tail that was half brown (immature) and half red (adult). First time posting here so I'm not quite clear on the decorum! Field marks? Well the looooong and pointed wings and that long beak with the wicked looking hook at the end. Also, as was mentioned above, it looks like a juvenile what with the white cap and bib to go with it. But I suppose I'm regurgitating info here! Siraphan -- Some of us old hands at this (both the Mystery Birds and bird ID in general) try not to reveal the secret, simply to give others a chance. But if you ever want to put your guess on record, feel free. psweet - thank you for your response! Well, I guess I'll toss my lot in as an immature Magnificent Frigatebird (Fregata magnificens). My reasons why are in my post before this. I've never had the chance to see one myself but I recognized the shape and went to work in my bird book. I agree with Siraphan and Birger Johansson...it is a frigatebird. I thought frigatebirds have a red pouch? I guess it is gender-specific? Sam -- the red pouch is indeed gender-specific. But most of the time, even the adult males that have it don't show it -- you only actually see the thing when they inflate it for courtship. In 1993 I had a July rental at the Galvestonian in Galveston, Texas. 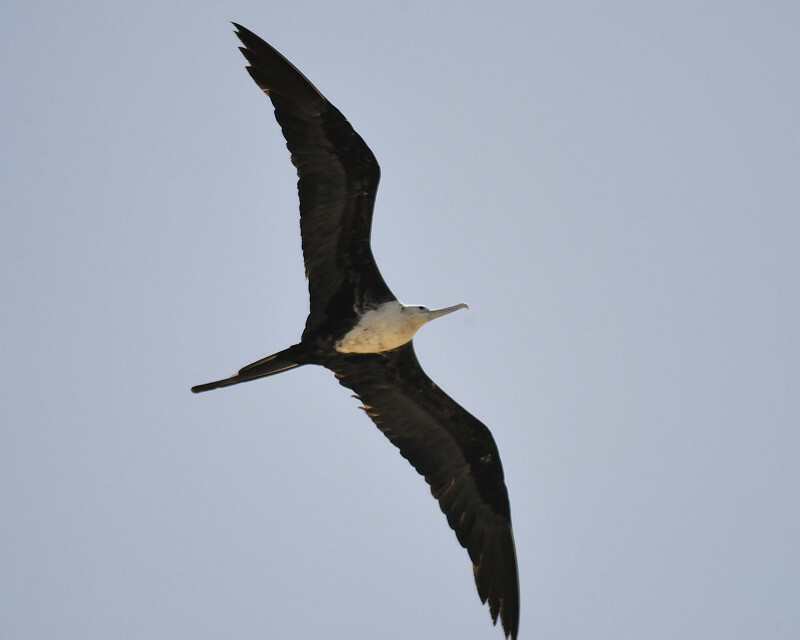 From the balcony of my 19th-story condo I watched two frigatebirds glide south into the Gulf of Mexico at dusk for what seemed like a very long time. Galveston is often disparaged by Houstonians as the "Poor Man's Riviera," but anyone with a trace of appreciation for nature can see sights like this at even a somewhat muddy seashore.